RICK OWEN, D.C. practices at 500 E WINDMILL LN SUITE 115, LAS VEGAS, NV 89123. RICK OWEN, D.C. treats back pain, sciatica, neck pain, shoulder pain, headaches, sports injuries, and auto accident injuries. To learn more, or to make an appointment with RICK OWEN, D.C. in LAS VEGAS, NV, Call (702) 778-7186 for more information. Post Graduate Externship: Back Pain Chiropractic in Louisiana / Texas for 2 years. UNLV and Bonanza HS alumni. Early Beginnings: Associate doctor in Texas and within 3 months, running his own practice. Dr.Owen worked in Texas for 2 years and then worked in Colorado in a high volume practice for 1 year before returning home to Las Vegas, NV. 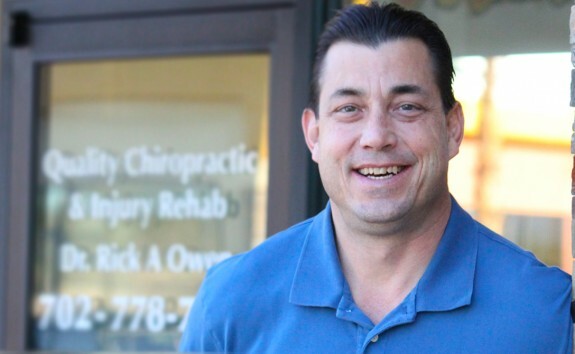 Dr. Owen has practiced in Las Vegas in both a private practice and a multidisciplinary clinic working with M.D.’s, D.O’s, and Physical Therapists, since 1992. Dr. Owen post-graduate training includes wellness and nutrition, scoliosis management, sports chiropractic, rehabilitative therapy for trauma, sports injuries, and chronic injuries, and cervical bio-mechanics.